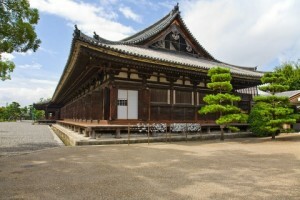 Sandzyusangendo (三十 三 間 堂, Sanjūsangendō) – the most popular name Temple Rengeo-in (蓮華 王 院, «Temple of the Lotus King”), located in the eastern part of Kyoto. The temple was founded in 1164, and then rebuilt a century later, after the original building was destroyed by fire.The temple is known for the fact that it contains a collection of 1001 the statue of the goddess Kannon mercy. 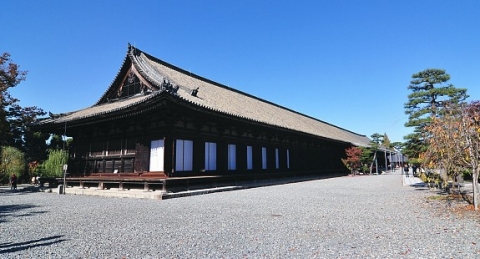 In addition, Rengeo-in – the longest wooden building existing in Japan, the length of 120 meters. Sandzyusangendo name, translated into Russian as “Hall 33 arches”, gives an idea of the internal structure of the church: 33 – this number spans between columns supporting the arch of the sanctuary – according to their number determines the overall value of the building. 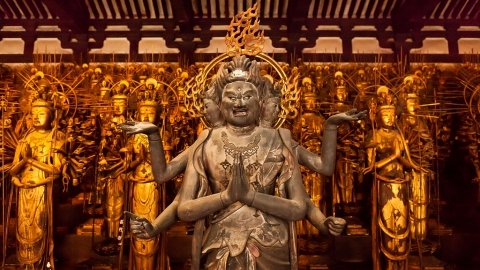 Number 33 was not chosen by chance: it is believed that the goddess Kannon has 33 different guises. 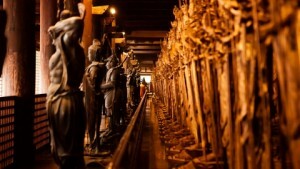 In the center of the room is a large wooden statue of the goddess of the thousand, which is on the right and left sides surround the 1000 articles with human growth. According to legend, Cannon has 11 goals and 1,000 hands to be able to help the greatest possible number of people, although the number of hands in the traditional statues limited to 42. The main statue of Bodhisattva carved out of cypress famous sculptor tanks. Now she is one of Japan’s national treasures. 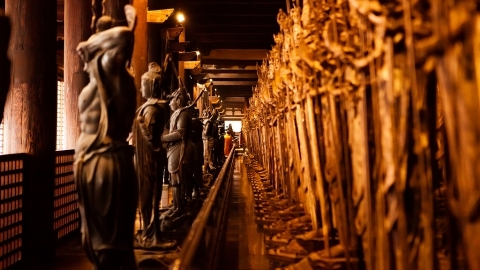 In the next room there are 28 statues of Japanese divinities-savers, embodying the various virtues, as well as statues of the guards of the temple: and Raidzin Fujinami – gods of thunder and wind. Sandzyusangendo is located within walking distance from the bus stop Hakubutsukan-Sanjusangendo-mae (10 minutes, 230 yen from Kyoto Station, buses №100, 206 or 208), and a five-minute walk from Keihan line Shichijo station, and a 20-minute walk from station Kyoto. Entrance closes half an hour before the official closing time.